This wonderful wine adventure gift box contains a collection of Booths own label wines from our extensive in store range. Booths Bordeaux – Produced from fruit sourced by some of the region’s most qualitatively conscious small growers. The balance and complexity comes from the blend of different vineyard sites with a variety of terroirs and styles. A classic Bordeaux blend combining fleshy Merlot with the frame of Cabernet Sauvignon. The result is a harmonious wine with notes of blackcurrant and cedar. Savoury and very food friendly, this is a wine of freshness and balance. A very versatile wine, at its best with roast meat or hard cheese. 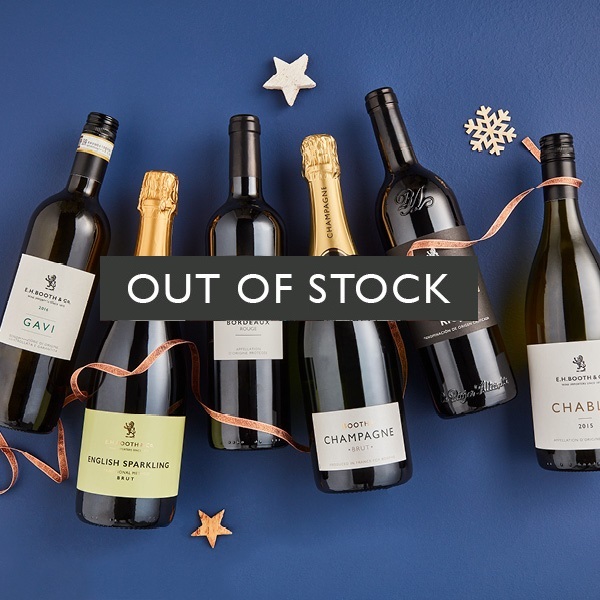 Booths English Sparkling Wine – Made in the South Downs of England, by award winning producers Ridgeview, this English sparkling wine is a blend of Pinot Noir and Pinot Meunier supported by crisp Chardonnay notes. The red fruits and toasty spice on the nose lead to an intense, yet elegant palate full of ripe citrus fruit with notes of brioche. The Pinot dominance brings depth and complexity, with the Chardonnay adding finesse and freshness. The richness of the palate and vibrant acidity make this a great food wine. Wonderful with rich fish dishes or canapés featuring duck or beetroot, it’s also perfect on its own. Drink now or age for the next 2 to 3 years. Booths Champagne Brut – Made from Grand and Premier Cru Chardonnay and Pinot Noir grapes, this elegant and balanced cuvee is ideal as an apéritif and flavoursome enough to complement fish and chicken dishes. Booths Gavi – Cortese grapes are a speciality of Piedmont, in North West Italy, and our zesty Gavi starts life in the vineyards and rolling hills. The delicate grapes produce a medium-bodied wine with a subtle but definite minerality and plentiful apple and pear aromas. Vibrant acidity and a touch of spice add character and backbone. Try it as an apéritif or with meaty fish dishes such as seared tune steaks.